Norwich scored six first-half goals as they thrashed Championship play-off contenders Reading. The hosts were 4-0 up within 31 minutes through Nelson Oliveira's penalty, Wes Hoolahan's chip, Alex Pritchard's 25-yard shot and Russell Martin's tap in. Pritchard slotted in his second before Yann Kermorgant pulled one back, only for Hoolahan to tap in for 6-1. Mitchell Dijks hit the bar for the Canaries before substitute Cameron Jerome slotted in number seven late on. Reading, who had won their previous three games, stay fourth in the table with five games left to play, six points ahead of seventh-placed Fulham, who beat Ipswich 3-1. Norwich, who confirmed on Friday that caretaker boss Alan Irvine will remain in charge for the rest of the season, had lost their previous two games without scoring a goal. But they ripped the Royals apart to become the first side since Portsmouth hammered York in November 2015 to score six goals in one half of an English league game. Oliveira started the rout from the spot in the third minute after being fouled by Chris Gunter, before Hoolahan chipped over Ali Al-Habsi from six yards from Timm Klose's pull-back. Pritchard made it 3-0 with a snap-shot from 25 yards into the top corner and steered the fifth into the bottom corner, with Martin having added the fourth from close range after Oliveira's shot was parried. Kermorgant headed in from a few yards out to pull one back but Hoolahan immediately restored the Canaries' five-goal advantage by tapping in from two yards. The second half was played at a slower tempo, but Norwich saw Al-Habsi deny Pritchard, Jacob Murphy and Klose before Jerome completed the rout. "It was an excellent performance. Bearing in mind the quality of the opposition I think it's the best display since I have been here. "The lads were absolutely spot on in the way they played both with and without the ball and to be honest we could have had a few more goals. "To be fair the home form has been good this season - it's just a shame that our away form has been so poor. It's difficult for a side to challenge when you have an away record like ours." "It was a tough afternoon for us - we needed to make it far more difficult for them than that. No-one plays badly on purpose but we needed to be more aggressive out there, we needed to show more. "It was just one of those days when all their shots on target seemed to go in, every loose ball seemed to fall to them although we didn't help ourselves. "I don't think it will affect the confidence of the players - all they can do now is learn from what happened to do and then move on, because we have some more very big games coming up. "We are obviously not happy with this result - but we are in a good position because of the way we play the game, and the way the players have been performing over the course of the season, and you have to remember that." Match ends, Norwich City 7, Reading 1. Second Half ends, Norwich City 7, Reading 1. Corner, Norwich City. Conceded by Tennai Watson. Goal! Norwich City 7, Reading 1. Cameron Jerome (Norwich City) right footed shot from very close range to the bottom right corner. Jordan Obita (Reading) is shown the yellow card. Jacob Murphy (Norwich City) is shown the yellow card. Substitution, Norwich City. Steven Naismith replaces Wes Hoolahan. Substitution, Norwich City. Cameron Jerome replaces Nélson Oliveira. Foul by Mitchell Dijks (Norwich City). 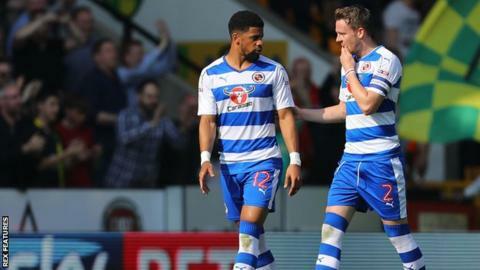 Garath McCleary (Reading) wins a free kick in the defensive half. Attempt blocked. Mitchell Dijks (Norwich City) left footed shot from outside the box is blocked. Assisted by Nélson Oliveira. Attempt missed. Wes Hoolahan (Norwich City) left footed shot from outside the box is high and wide to the right. Assisted by Ivo Pinto. Mitchell Dijks (Norwich City) hits the bar with a header from the centre of the box. Assisted by Wes Hoolahan following a set piece situation. Substitution, Norwich City. Josh Murphy replaces Alex Pritchard. Jonny Howson (Norwich City) wins a free kick in the attacking half. Substitution, Reading. Danzell Gravenberch replaces John Swift. Attempt missed. Liam Kelly (Reading) right footed shot from outside the box is too high. Assisted by Garath McCleary. Attempt saved. Timm Klose (Norwich City) header from the centre of the box is saved in the top right corner. Assisted by Wes Hoolahan with a cross. Corner, Norwich City. Conceded by Reece Oxford. Attempt blocked. Jacob Murphy (Norwich City) right footed shot from the centre of the box is blocked. Attempt saved. Jacob Murphy (Norwich City) left footed shot from the left side of the six yard box is saved in the centre of the goal. Assisted by Ivo Pinto. Attempt saved. Yann Kermorgant (Reading) right footed shot from the right side of the box is saved in the top centre of the goal. Assisted by Lewis Grabban. Attempt missed. Nélson Oliveira (Norwich City) right footed shot from the centre of the box is close, but misses to the left. Assisted by Alex Pritchard. Attempt missed. Yann Kermorgant (Reading) header from the left side of the box misses to the right. Assisted by Liam Kelly. Attempt missed. John Swift (Reading) left footed shot from outside the box is high and wide to the left. Assisted by Liam Kelly. Offside, Norwich City. Nélson Oliveira tries a through ball, but Jacob Murphy is caught offside. Attempt missed. Nélson Oliveira (Norwich City) left footed shot from the left side of the box misses to the right. Assisted by Jonny Howson. Attempt blocked. Alexander Tettey (Norwich City) left footed shot from outside the box is blocked. Assisted by Jacob Murphy.